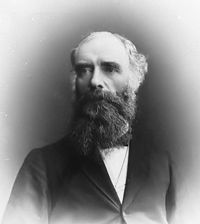 Donald Alexander Smith was born in Forres, Scotland on the 6th August 1820. He entered an era of unprecedented change and ingenuity. From fairly humble beginnings, Donald Smith would become a leading light in the development of Canada and in so doing, become a self made millionaire. In short, he was a remarkable man. Donald’s dreams and ambitions were shaped from an early age by his uncles, Robert and John, who worked in Canada for the Hudson Bay Company. Their tales of adventure and excitement would lure him away from Scotland and his job in Watson’s legal firm where he copied legal texts. He joined Hudson Bay Company and left Britain on the 16th May 1838, setting sail with a sense of anticipation, eagerness and hope. Donald was employed as an apprentice clerk by the Hudson Bay Company, who at that time owned a considerable amount of land in Canada. He was stationed at the trading post of Tadoussac, Quebec, that comprised of no more than an occasional house. It was a severe and demanding landscape which was particularly inhospitable during the winter months and such an experience was to shape Donald’s character. His job was to value furs and detail the various transactions in the financial accounts. His talents were apparent to the company and he steadily rose through the ranks: 1855 he managed the district of Esqimaux; 1862 he became Chief Factor; 1871 Chief Commissioner; 1874 Land Commissioner and finally Governor of Hudson Bay Company in 1886. Arguably one of Donald’s greatest feats, however, was beyond the confines of the Hudson Bay Company. 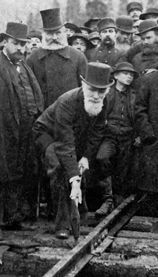 Donald Smith was instrumental in the ambitious and bold project of building a pioneering transcontinental railway from Montreal to Vancouver on the Pacific coast. In this colossal venture, Donald was both Director of the syndicate and principal shareholder. His vision and perseverance in this far-sighted endeavour earned him the right to drive in the last spike of the railway line on the 7th November 1885; a ritual that is repeated even to this day, which illustrates the impact of this accomplishment. This railway opened up the North-West of Canada for trade, industry and settlers by reducing the Montreal-Vancouver journey from two weeks to two and a half days. During this time he also became a very shrewd and astute investor and developed a considerable share portfolio. The magnitude of his influence and power was perhaps demonstrated through his directorship of the Bank of Montreal in 1872 and becoming the President of the Bank in 1886. By this stage he was certainly a man of substance and a key figure in Montreal and Canada more broadly. In 1896, however, he was to return to London and the UK in order to take up a post as High Commissioner essentially Canada’s representative in the UK, a post he would relinquish only at the age of 90. His lifelong work and his illustrious career was publicly acknowledged in 1895 when he was bestowed the Knight Grand Cross of St Michael and St George. He was also to enter the peerage in 1897, when he became Lord Strathcona in Argyll and Mount Royal in Quebec and Canada. Unsurprisingly there is a great deal of literature written on Donald Smith’s business achievements, which were numerous and also impressive in nature. Care must be taken not to overlook other aspects of his life as his business career demonstrates only one facet of his personality. His philanthropic work was prolific and he gave generously to numerous institutions from Ballachulish & Glencoe Shinty Club to King Edward’s Hospital Fund. A series of donations worth noting, as it demonstrates one side of Donald’s character, are his donations to McGill University in Montreal. Distinctively, he felt strongly that women should be have the opportunity to participate in higher education and bestowed a $50,000 endowment in 1884 specifically to fund women’s education. In fact, he joined the University’s board and in 1899 appointed the first female principal, Hilda Oakley, to the University. We might be forgiven for failing to consider the more personal side of Donald Smith as his achievements seem to overshadow all else. In terms of appearance, an observer, Mr McClintock, in August 1860 commented on Donald’s appearance, “he was about forty years old, some five feet ten inches high, with long sandy hair, a bushy red beard and very thick red eyebrows”. This very Celtic red colouring would fade into a very distinguished white.